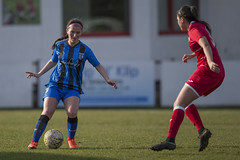 Gillingham Ladies FC fought back from behind twice to earn a well-deserved 2-2 draw against Loughborough Foxes Ladies FC at Maidstone’s Gallagher Stadium. 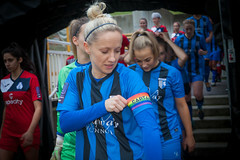 Both teams were in support of LGBT charity Stonewall’s ‘Rainbow Laces’ campaign today, donning the colourful bootlaces in a show of solidarity and with the overall aim of increasing the number of LGBT allies in the sporting world. The opening minutes of the match were relatively quiet. 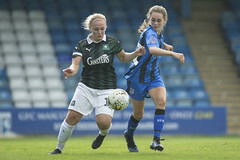 Loughborough seemed to be on top with regards to attacking, but they were unable to find many clear-cut chances in the first 10 minutes, with attacks from the Foxes being dealt with by Courtney Shanly and the Gills defence. Loughborough came close just before the 20-minute mark, with a low cross from Eva Rogers meeting Charlotte Broad, who shot just over Shanly’s crossbar. 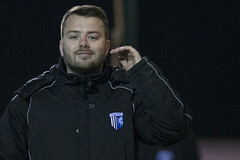 Gillingham’s first direct chance came in the 26thminute, after Grace Seely was elbowed in the back, but Sammy Booker’s shot was sent straight to the keeper. Gillingham were denied the chance to go 1-0 up in the 28thafter Daisy Monaghan’s through-ball was chased by Breon Grant, drawing the Loughborough keeper out, but it was dealt with by the Foxes defence. The first goal of the game came in the 36thminute, with Loughborough’s Chloe Young heading home from a well-struck corner. A good chance just before half time saw Sammy Booker in on goal, forcing a challenge from the Loughborough goalkeeper to send the Gills into half-time 1-0 down. The Gills kicked off the second half under floodlights. The ladies were keen to put their stamp on the game, and looked much brighter in attack, challenging the Loughborough defence twice in the opening minutes of the half. What followed was a flurry of action at the Gallagher, with Gillingham equalising in the 52nd thanks to a Sammy Booker cross that tricked the keeper, bouncing in off the woodwork. However, seemingly moments later, Loughborough restored their 1-goal lead from another corner, answering Booker’s goal with a Charlotte Broad bundle that saw Loughborough back in the driver’s seat. The Gills were not planning to give up though, and were fighting for every chance. Grace Seely came close to bringing it back level, with a through ball from Lydia Huntly forcing a Loughborough block and a Gillingham corner, that unfortunately was not converted. The Gills began to have the lion’s share of possession for a period after this, troubling the Loughborough defenders and shutting down attacks. Cries for a Gillingham penalty around the 65thminute were waved away after Alice Bussey was brought down in the box, with the referee’s reaction being met with derision by the Gills fans. 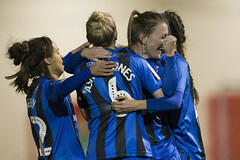 Gillingham drew level again in the 78thminute with a Grant half-volley from outside the box that beat Loughborough’s Amy Burle and found the top-right corner, dinking the post as it thundered in. The Gills were well and truly back in the game now, and looked the better of the two sides as they relentlessly chased the winner. Loughborough were gifted a free-kick in the closing minutes just outside of the box, which was bravely blocked by the Gills wall, with Siobhan Eastman heading it wide. Loughborough were awarded another free-kick in a similar position after a high challenge on Rebecca Knight, but Loughborough were unable to find their winner, with the match ending 2-2. Gillingham LFC will face Loughborough Foxes LFC again next week in the FA Cup 2nd Round away from home, with the next home match being against Chesham United Ladies in the FA WNL Plate.